Homycasa Armless Computer Desk Chairs Task Seating by HOMY CASA at Indsight. Hurry! Limited time offer. Offer valid only while supplies last. Features : Pneumatic seat-height adjustment. Backrest can be flipped over. 250 lb. Weight Capacity. 360-degree swivel. Smooth-rolling casters. Backrest can be flipped over. Small Swivel Desk chair for kids and adults. Seat Size: 16"(W) x 15"(D); Backrest Height: 15". Adjustable Seat Height:13"-18". 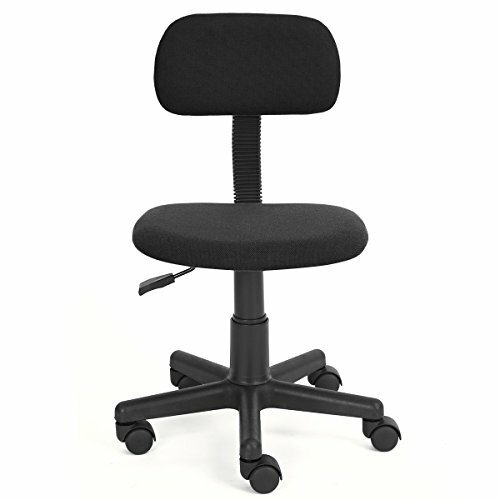 Total Chair Height: 29"-34". High quality furniture.Perfect home office combination set. Padded seat and back for all-day comfort and support.